2001. Hardcover. Good. Major signs of wear on dust jacket but book is fine. 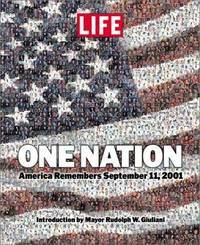 Offers a photographic account of the events of September 11, 2001, the rescue efforts in the days following the attacks, and the response of a nation united in sadness, pride, and resolve. 2002. Hardcover. Like New. Dust jacket shows signs of minor wear. 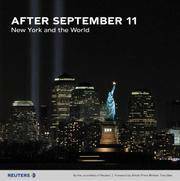 In After September 11, Reuters' worldwide team of journalists and photographers chronicle the days since 9/11, illuminating their meaning at every level -- from the beginnings of personal healing to the new geopolitics. This book begins at Ground Zero, bringing together new stories, stunning images, and interviews with those most deeply affected -- from the rescuers and the families, to those struggling to rebuild businesses of every kind. Next, it offers an extraordinary snapshot of the United States as it seeks to comprehend the attacks, understand its new place in the world, and respond effectively. Finally, Part III examines the world after 9/11: politics, alliances, war, safety, and much more.